Place all washed and dried spinach into a 15″ x 9″ baking dish. In a shallow dish, add flour, and coat each chicken breast lightly and place on top of chicken. 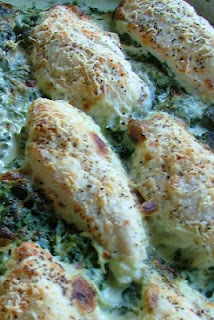 Pour whipping cream onto spinach, trying to avoid pouring it onto the chicken. 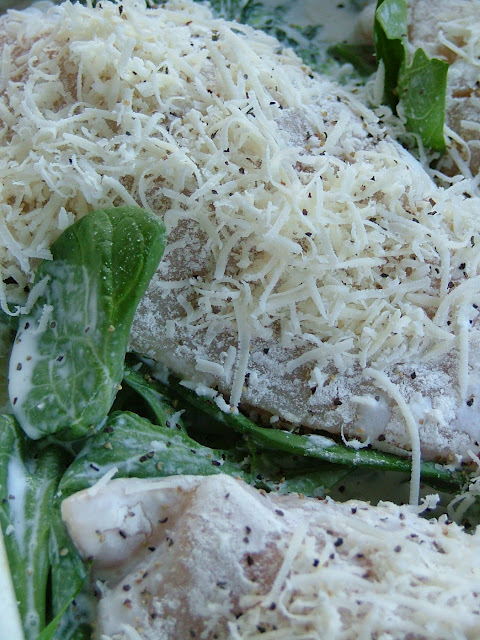 Sprinkle Romano cheese on top of chicken breasts and season with sea salt and freshly cracked pepper to your desired taste. Bake in a 350 degree oven for 45 minutes, or until chicken is light golden brown.